The New World of IT: Connected, Strategic, and Efficient-Far-Reaching Effects of Unified Access is the fifth of a five-part webcast series from Cisco and Nemertes. Learn how a unified access architecture will help your organization reduce costs and streamline security and management while making the organization more agile. The New World of IT: Connected, Strategic, and Efficient-Use the Evolution: BYOD is the fourth of a five-part webcast series from Cisco and Nemertes. Learn about the key areas technologists must control in a BYOD environment? Find out how your organization can benefit from this unstoppable trend. The New World of IT-Connected, Strategic, and Efficient: Information Technology Transforms to Enterprise Technology is the third of a 5-part video series from Cisco. Join Robin Gareiss, Executive Vice President and Senior Founding Partner for Nemertes Research as she discusses how to prepare your IT organization for the transition into a more strategic, business-critical function. The New World of IT: Connected, Strategic, and Efficient-The Internet of Everything is the second of a 5-part video series from Cisco. Join Robin Gareiss of Nemertes Research as she discusses how the Internet has become the conduit to connect not only people, but also things. See how you can use the Internet of everything in your organization. 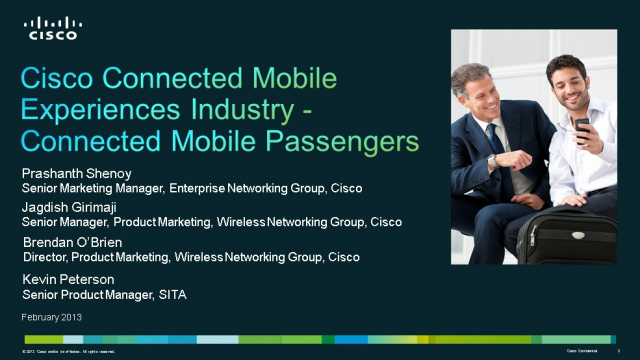 The New World of IT: Connected, Strategic, and Efficient-Connected Mobile Experiences is the first of a Five-Part Webcast Series from Cisco. Learn how businesses are using mobile technology to connect with and better serve their customers and partners, based on location. During this final webinar in our five-part series, you will learn how Cisco WAN architects guide enterprise customers to evolve their networks for cloud computing. Traditional networks were not developed with the cloud model in mind. With 50 percent of enterprises moving to the cloud by 2014, now is the time to strategize on next-generation WAN design to accelerate your journey to the cloud. Don’t let the network be an afterthought during your journey to the cloud. Sign up for the Cisco webinar series today and ensure your success. Don’t compromise between the cost efficiencies of virtualization and branch survivability. With more than half of today’s workers in remote offices, and even more going mobile, IT is challenged with scaling resources to deliver and support applications in remote locations, where IT staff may not be available. Although data center centralization is helping, compromising WAN performance can bring business to a halt if remote and mobile workers have trouble accessing mission-critical applications. The Cisco x86-based enterprise class server can be hosted in the widely deployed Cisco Integrated Services Router (ISR), allowing businesses to extend their virtualized data centers to the branch. The solution offers a consolidated form factor that is simple to provision, monitor, and manage from remote locations. While cloud computing increases business agility and efficiency, it also introduces new security risks. Technology issues and process changes can complicate the transition to this new way of business computing. How will backhauling traffic impact performance? How will you scale security services to protect hundreds of sites—all accessing your apps in the cloud? Are you moving your apps to the cloud? What will the impact be on your network resources? How will you provide a consistent user experience?